We had received a copy of recently released book titled 'Administration of Union and States with special reference to Tamilnadu' for TNPSC Group 1 and Group 2 Mains Examinations authored by Mr.Iyachamy . Since, there is no comprehensive book for the 'Administration of Union and States with special reference to Tamilnadu' Paper, the book has come as a gift for the Group 1 and Group 2 Mains Examination candidates. Being an aspirant for the UPSC and TNPSC exams, the author has given his full efforts to make this as a comprehensive study material for the Mains Preparation. 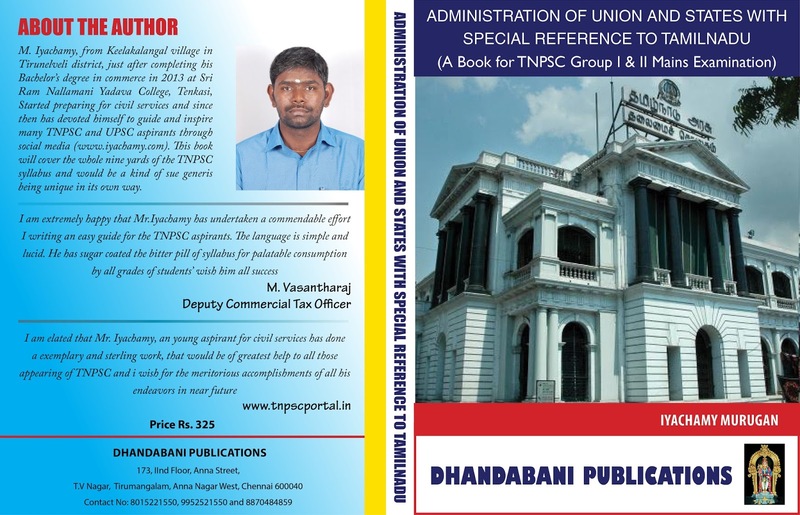 We recommend this valuable book to all TNPSC Mains candidates and congratulates Mr.Iyachamy for this good product.